Biscotti: Recipes from the Kitchen of the American Academy in Rome arrived in my mailbox last week. Within minutes of opening the cover, I knew I’d found my favorite book of the season. The diminutive book contains sixty Italian cookie recipes, ranging from classic ciambelline and cornmeal cookies to almond macaroons and pine nut cookies (made without almond paste). The well-photographed book is thoughtful, listing ingredients by weight as well as volume. Compared to typical American cookie recipes, these recipes are less sweet and are nut-heavy, embracing almonds, hazelnuts, pine nuts, walnuts, and even peanuts (under-appreciated in Italy). Flavorings are natural and clear, featuring lemon and orange peel, figs, anise, cinnamon, fennel seeds. 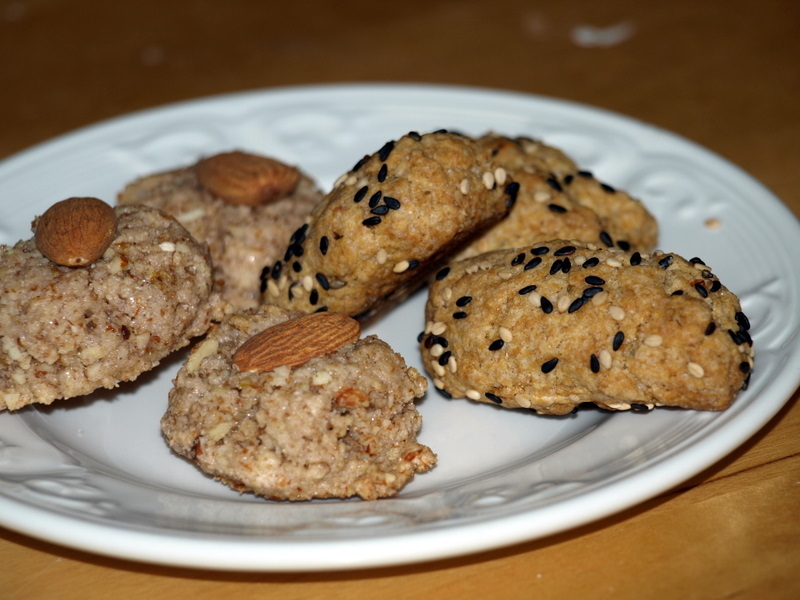 Best of all (to me), the recipes yield modest amounts–these are cookies for slow savoring alongside coffee or tea, rather than mass quantities for hungry hordes. If you have any fond memories of wandering an Italian town while munching on cookies from the local forno, you’ll probably find the cookies of your dreams in Biscotti. Yesterday, I baked the biscotti regina (sesame seed cookies) and biscotti Lucia (almond macaroons), a neat juxtaposition of recipes as the regina required an egg yolk and the Lucia required an egg white (though the recipe is written for 1-1/2 whites, it’s easy enough to re-scale it). Both, pictured above, were an immediate hit with guests, though I did manage to save a few for this morning’s cappucino. Thanks to a thoughtful friend’s gift of Sant’Eustachio coffee beans, it was a thoroughly Italian breakfast.